Back in October, when we were down in Costa Mesa for Pastor Chuck Smith’s memorial, we ran into a friend who had moved from Washington back to southern California. I almost didn’t recognize Ken, because he had lost 70 lbs since we’d seen him last, which really hadn’t been that long. Have one cheat day a week, and do cheat. Eat what you’ve been craving. Before you do that, though, have a glass of grapefruit that morning. When I look at that list, it looks to me like Atkins + more vegetables + beans + a cheat day. And that makes me go, “Hot diggity.” Because I could do Atkins for three weeks, but then it was the thought of NEVER AGAIN having a piece of toast that would do me in. Just toast. Not even expensive bread … just … a wee piece of the cheap kind. Toasted. Not only that, but the very limited veggies on Atkins (almost none in those first weeks) eventually made me start eyeing okra with longing, and I absolutely despise okra. So I’m looking at the Slow Carb diet, and I’m thinking it might just do the trick. The “science” behind it is that by eating legumes, which are a slow-releasing carbohydrate, and protein, which satiates your hunger and keeps it at bay a long time, and by breaking your craving for bad carbohydrates (read: sugar), you have a shot at reaching a healthy weight and gaining more energy. The cheat day is designed to a) shake up your metabolism so the diet keeps working, and b) dangle a carrot (or maybe carrot cake) out there in front of you so you can get through the rest of the week. I’m game. Plus, I’ve seen the results with my own eyes. Ken looked great. He said for him, living in southern California, this is a no-brainer. He just thinks of himself as being on a Mexican diet: fajitas minus the cheese and tortilla; tacos minus the cheese and shell, and lots of beans. I like Mexican plenty, so I’ll be experimenting along those lines in the coming weeks. But for my first Slow Carb recipe, I adapted one I found at markgarcia.com. I just jazzed up his basic recipe a tad and it was A.Mazing. No one in your family will feel deprived. Not for a minute. In a large skillet, pour a few glugs of oil and let heat. Add diced onion and let cook while you are dicing the chicken thighs. When the onion is almost translucent, add the diced chicken and stir to combine. Let this mixture cook for about 7 minutes, or until chicken is cooked through. This will depend on how small you diced the meat. Add the minced garlic and the diced water chestnuts and stir. Let mixture cook another three minutes, stirring often. Add the lime and lemon juices and stir. Add the rest of the seasonings and stir well. Let cook a minute or two and taste. If it needs more heat, add more sambal oelek. When the sauce has thickened, remove from heat. 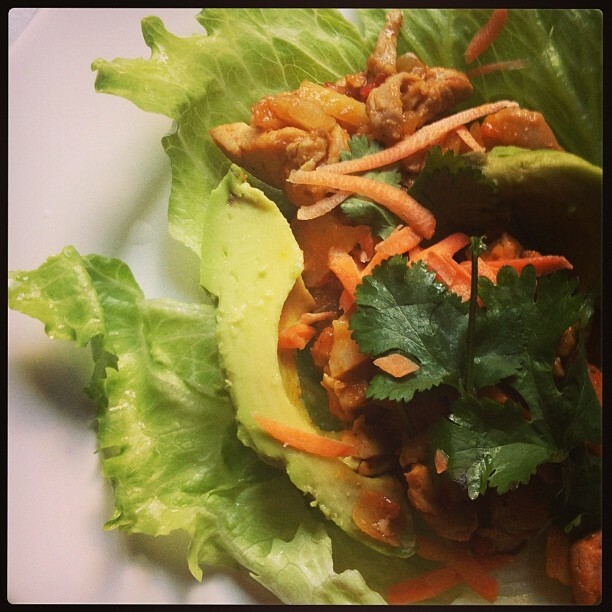 Lay clean lettuce leaves on plates, fill with about 1/2 cup of mixture, top with carrots, avocado and cilantro, and serve. I’m pretty sure I’ll be having this every day for the rest of my life. Oh, I’ve lost 25 pounds and have kept it off!